It feels like there must be some kind of conspiracy to keep tourists away from Antwerp: the official website is truly shocking, coverage in guidebooks is poor at best (normally tagged onto the end of guides to Brussels as a suggested daytrip), and Eurostar don’t appear to make any kind of effort to point out that tickets from London to Brussels also allow free onward travel to any station in Belgium (meaning that central Antwerp is less than three hours from central London, making it quicker to reach than pretty much any city you have to fly to, not to mention much greener). The only explanation I can think of is that the experience of being conquered by the Romans and the French, sacked by Vikings and the Spanish, blockaded by the Dutch and the English, and bombed by the Germans has left them slightly wary of outsiders. 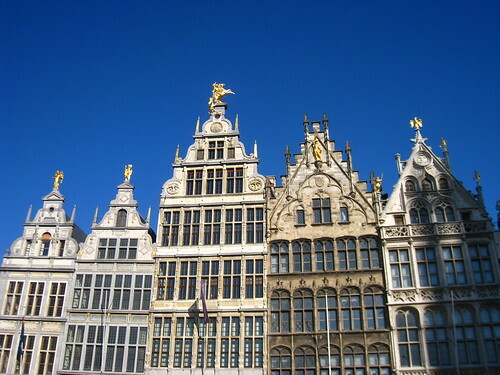 Guild houses in the Grote Markt. Rebuilt after some early Spanish visitors burnt them down. 1) It’s almost the perfect place for a weekend break – there’s easily enough to do to keep you busy, but small enough to see everything on foot if you want. Easier still is to hire bikes, as the city is entirely flat, has cycle lanes everywhere, and hardly any traffic anyway. Cycling round the city allows you to explore the crumbling, atmospheric quays. 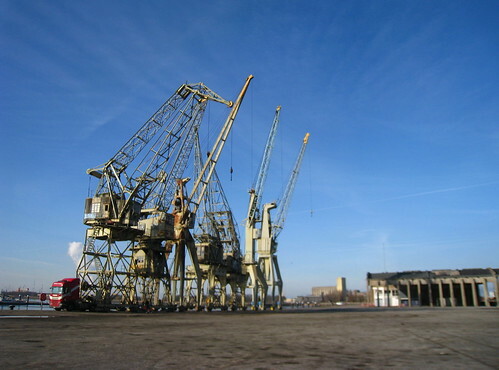 On the edge of town, the new port is still the second biggest in Europe, and goes on for miles. 2) It has loads of great architecture, ranging from the 16th century Onze Lieve Vrouwe Cathedral, with its beautiful spire, through the guildhouses in the Grote Markt (which to my mind is just as nice as the much more famous Grand Place in Brussels, except without the crowds), to crumbling warehouses and cranes on the quays along the banks of the Scheldt, and a great selection of art nouveau buildings too, including this rather mad one with a boat poking out of the side. 3) I knew before I left that Antwerp was supposedly a stylish city (it appars to be compulsory for any travel article on the city to mention the Antwerp Six), but I was surprised at quite how obvious it was – the city is completely overrun with clothes shops, ranging from expensive designer brands to new designers and smaller, quirkier places; there are loads of shops selling loads of cool stuff for the home, and just looking at people in shops and restaurants you can just tell that people really make an effort. 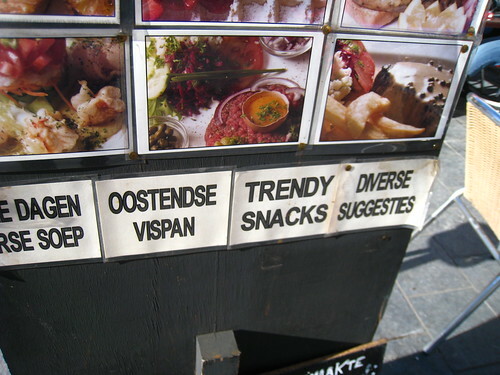 4) The stylishness extends beyond the shopping – it has a great selection of bars and restaurants, although we missed out on most of the trendiest ones by not booking tables in advance (there may not be many tourists but the locals certainly seem to like eating out). No great loss though, as I’m a big fan of traditional Belgian cooking, and was able to find it at De Stoemppot, which serves all the traditional classics like waterzooi (fish stew), stoofvlees (beef stew) and sausages, all served with yummy stoemp (Belgian mash). They even serve the normally disgusting staple of Flemish & Dutch fast food, the croquette, which were far nicer than the normal version. While we’re on the subject of food – forget the Belgian cliche of having chips with mayo, on a cold day in February the only way to have them is with warm stoofvlees sauce (i.e. gravy). Mmmm. 5) The choice of places to stay is great too, and the way to go here is apartments: we stayed in Britselei 37, in an old townhouse on the edge of the centre, which was great (apart from the fact it was about 30% more expensive than planned thanks to the pound tanking in between booking and arriving). There are loads more in a similar vain, with way more character than the average hotel. 6) Last but not least, I may be a spectacularly lapsed catholic, but I do like to see a city with a fanatical devotion to the Virgin Mary. Not content with dedicating a cathedral to her (which you really can’t miss, as it dominates almost every view), they have an obession with seemingly building a statue of her on every street corner, some of which are hugely elaborate. 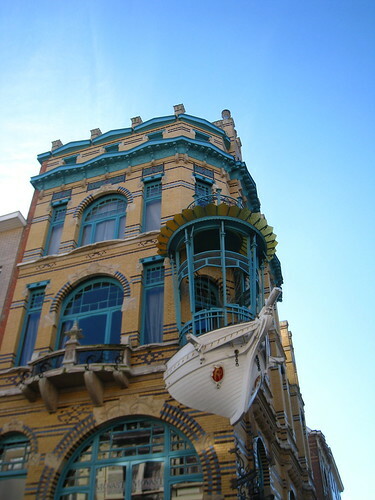 This entry was posted in Belgium and tagged "green travel", Antwerp, Antwerpen, Anvers, Belgium, blogsherpa, Europe, Flanders, Flandres, Vlaanderen. Bookmark the permalink. The architecture is, indeed, alluring. I don’t hear a lot about Antwerp either in travel circles. I’d be interested to learn the background on the reason behind the Virgin Mary statues throughout the city. 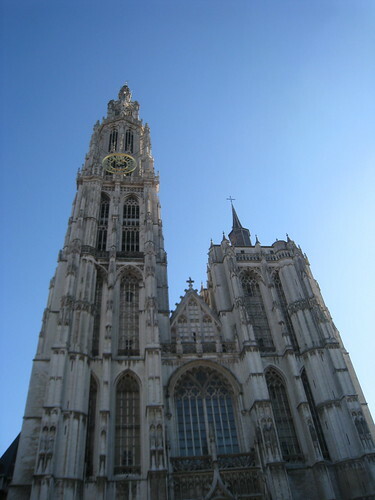 During a recent tour of Antwerp our guide said that there was a propery tax dispute between a building owner and the city. The city claimed that a lower tax rate only applied to places of worship. 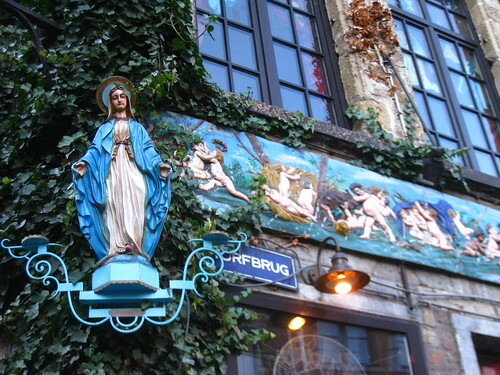 The owner put a statue of Mary on his building . When the city still required the higher rate, he appealed to the church authorities who ruled in his favor. Once word got out, statues went up everywhere. Saving money and not souls was evidently the motivation for the many remarkable Marian statues . The picture of the cathedral looks very familiar.. I think a credit is due? Whoops, I meant to email you to ask but forgot! Busted…. Ooh, top tip. Ta. Have been flirting with the idea of going to London from Berlin via train, so Belgium has gone on the radar. But, bugger, no direct trains between Berlin and Brussels (which there used to be). And, double-bugger, of course the plane is 80 times cheaper. But, anyway, yes, Belgium is full of nice towns. And food. And beer. Don’t think so … I last visited in 2000, and they STILL send me newsletters very month. I liked Burie’s (for chocolate) Fritkot Max (for chips), the Diamond Museum, Diamondland, the Plantin Moretus museum and the springtime ‘Semini’ celebrations. wow – thanks for the information, that´s really fascinating! ow jeah… since it was motherday… we are the only city in Belgium wo celabrates mothers day on the 15th of August… guess why ? the day of the assumption, when Mary mother of Jesus was taken up into heaven… well that’s about it for the completion of the history lesson… rock on !